– Rainer Werner Fassbinder is quoted as writing these words in an excerpted essay on Douglas Sirk (originally published in the February 1971 issue of Fernsehen und Film) that’s been translated from German and reprinted in this luscious new high definition collection of what very well might be the filmmaker’s strongest yet most deceptively simple masterpiece All That Heaven Allows. 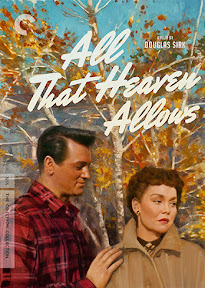 Arriving in theaters in 1955, Heaven was sandwiched in between the releases of his sudsy smash hit remake of Magnificent Obsession (which also starred Heaven leads Jane Wyman and Rock Hudson) and his technically audacious epic soap Written on the Wind. On the surface Heaven might seem anticlimactic (even underwhelming) due to its lack of a far-out twist or high concept hook as utilized in the other two films. But in retrospect, it's his emotionally purest and likewise most relatable picture in a prolific 1950s run that would later include the '59 remake that closed out his string of hits by way of Imitation of Life's remarkably bold, racially complex meditation on mothers and daughters. And long before Robert Redford studied suburban dysfunction in Ordinary People and Sam Mendes did the same with the Alan Ball penned satire American Beauty, Sirk took a very different approach. 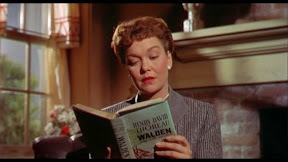 Instead of fixating on the point-of-view of sensitive teenagers as they did in the two later Oscar winners and continue to do so today in contemporary Hollywood to sell tickets, Sirk centered his oeuvre on middle-aged-women who had yet to be given an authentic, intelligent cinematic voice or identifiable screen representation. Usually relegated to serving as the supportive “yes” (wo)men to their gray flannel suited husbands or doting after children like June Cleaver on the small screen, Sirk’s films put women front and center for the first time since World War II saw a rise in Bette Davis-stylized women’s weepies or Barbara Stanwyck Noir. Critiqued and dismissed at the time as a merely sentimental director of “women’s pictures,” even Sirk was once quoted as philosophically saying that art was close to trash. Nonetheless, his previously overlooked works have been reassessed in new light decades later by legions of fans (including film buffs, filmmakers, and feminists alike) that are now able to see with repeat viewings just how much Sirk packed into his picture perfect frames and emotionally charged mise-en-scenes. Revered by everyone from Woo to Haynes (whose gorgeous Far From Heaven is a Sirkian love letter of epic proportions), even Martin Scorsese dedicated a number of fascinating show-and-tell breakdowns of Sirk’s ‘50s era Universal Pictures in his film-school like DVD miniseries A Personal Journey With Martin Scorsese Through American Movies. 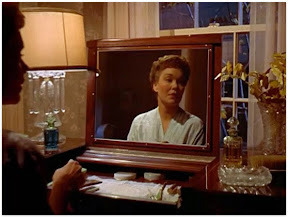 It was in Scorsese’s documentary that I was first introduced to Sirk’s ability to layer each one of the twenty-four frames that comprised a second’s worth of screen-time with sophisticated subtext so that it would hit the viewer on an intellectual, emotional and intuitive level simultaneously. 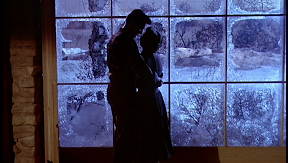 Sirk’s painterly usage of light and shadow along with his masterly understanding of frame composition invites you to hit the freeze frame (and step-by-step) buttons on your remote again and again, pulling any shot out to evaluate it like an illustration in a storybook or a work of art in a museum that adds to the film’s overall meaning. In fact, Sirk’s ability to make viewers think right along with his female characters is so legendary that the Criterion Collection has been honoring his work for over a decade. Therefore, in preparation for this review, I took a look back at Criterion’s recent Magnificent release. Two of Obsession's most dazzling extras took us behind-the-scenes where acclaimed female helmers Kathryn Bigelow and Allison Anders both offered unique perspectives of the man that once again celebrated the impact he had on giving women a voice in an era where very few women were in any kind of position of power to impact Hollywood filmmaking. 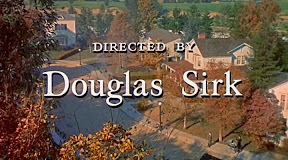 Serving up personal and academic observations that widen our appreciation of Sirk’s body of work in two interviews that are well-worth watching, one quote referenced by Bigelow helped sum up the Sirk's technical perfection. 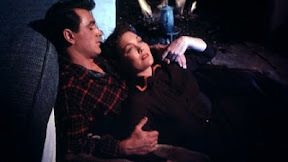 The top director at Universal at the time, although Sirk understood that Hollywood required a happy ending, he was insistent that the studio would not interfere with his camera or his cuts as Laura Mulvey’s Heaven essay reveals. Yet according to Bigelow, he took it further in his belief that “the angles are the director’s thoughts. The lighting is his philosophy,” and that’s exactly what comes through in all of his films. 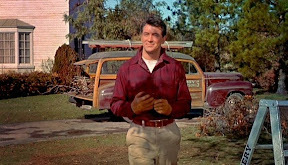 But perhaps due to its lack of a showy plot or gimmicky hook, this is particularly apt with regard to Heaven, which tells the story of a lonely widow (Wyman) who falls in love with the much younger Emerson/Thoreau incarnate gardener and tree grower named Ron Kirby (Rock Hudson). Kirby is perhaps not too much older than her two spoiled, insufferably solipsistic college-aged children that consist of a pre-feminist Freudian-focused female psych student (who grows compassionate to her mother’s plight far too late) as well as her Oedipal minded older brother who’d much rather his mom marry an old fuddy-dud friend of their deceased father than be passionately in love. 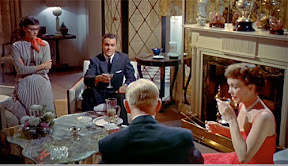 While age is never that much of an overt issue as it undoubtedly would be in a modern movie (thanks to the abhorrently sexist hot-button slang terms of MILFs and cougars), Sirk builds up conflict in clever framing including his favored motif of objects and mirrors as barriers to help divide a person and signify the choices they’re facing. Instead of age – conformity of ‘50s suburbia is the main wedge that threatens to split Heaven's couple apart as Wyman’s compassionate Cary is damn near ostracized by the entire town of gossiping women and philandering men who want to punish her for trying to break away from the cold (even in springtime) air of main street U.S.A. 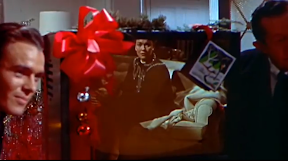 Adding in another intertextual layer, Cary's children opt to get their mother a television set as a sort of human surrogate offering comfort for the lonely citizens of the world. In addition to arguing for the Walden’s Pond like purity of life with Ron Kirby over this artificial world of small town judgment and keeping up with the Joneses that haunts Cary, the fact that this luscious widescreen Cinemascope film depicts television as a tiny box of phony punishment serves a dual purpose. Though it means one thing on the screen, subversively it informs audiences that when they do seek out entertainment, there is only one true dream factory as you certainly aren’t going to see Sirkian worlds of Magnificent technicolor artistry on your 1955 black and white living room television. Of course, to be fair even sixty years of endless homage (from Tarantino to Wong Kar Wai) later, there’s still no substitute for the sensory overload found in a subtextual soapy Sirkian portrait of American beauty. Undoubtedly influenced by his European background along with his love for the woman with whom he fled Germany to keep safe – more than just float gracefully from room to room, Sirk’s women think, feel, and invite you to do the same as evidenced in this newest celebration of his 1955 exploration of love, life, and the pursuit of Heavenly happiness here on Earth.